As I mentioned on Wednesday, I am doing a mini-series outlining the basics of makeup brushes as the world of brushes can be quite overwhelming. Make sure you check out part 1 of this series focused on eye brushes here! Today's post will be focused on the uses for different styles of face brushes. Apologies in advance that some of them are a bit dirty - I am overdo for a good brush cleaning session. Without further ado lets dive in! In the photo above, we have (from left to right) a blush brush and a setting brush. 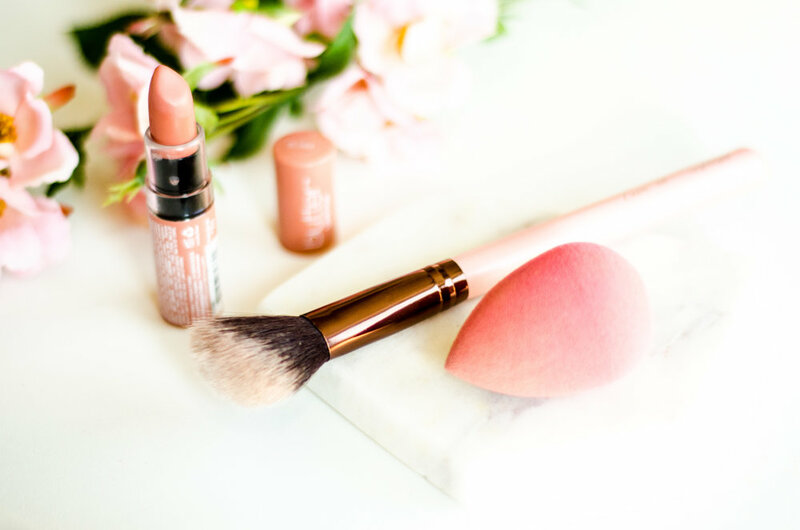 Blush brush: As the name suggests, this blush is ideal for applying blush. I personally love a super dense, fluffy brush like the one pictured above as not only does it feel lovely on the face, but it picks up the perfect amount of powder and disperses it evenly on the face as well. This brush in particular works well to blend out both powder and cream blushes, allowing you to control how opaque or sheer you want your blush coverage to be. Setting brush: This brush is best used to set powder, particularly on your undereye area. Its small size allows for total control in the small areas on your face. Like the blush brush, it's great to have dense bristles in this style of brush in order to pick up powder. However, the slightly flatter shape allows you to pat the powder into the undereye area you're setting rather than sweeping it across larger areas of your face. In the photo above, we have (from left to right) an angled brush and a beauty blender sponge. Angled brush: This is the optimal brush to use for contouring. Its angled bristles fit snugly underneath your cheekbone and follows the shape of the crevice in which you're applying your contour powder nicely. I place the top point of the brush in the highest point underneath my cheekbone and follow the line of the brush/my cheekbone to contour. Again, I like a super dense brush (are you sensing a theme here?) to pick up a good amount of powder and distribute it evenly. You can also squeeze the bristles together to contour lines on the sides of your nose. Revolutionary. Beauty Blender: You've like heard about this product before and I'm here to tell you that the hype is real. You can use this sponge to blend out your foundation or any cream products such as contour, blush, or highlighter. The Beauty Blender works best when you wet the sponge then squeeze out the excess water, leaving it damp. To blend, you simply apply the product on your face (with your fingers or a brush), then bounce the sponge against your face. You can also apply product directly to the sponge but I find that the Beauty Blender absorbs more product when you apply the makeup that way. In the photo above, we have (from left to right) a powder brush, a stippling brush, and a face brush. Powder brush: This is a large brush ideal for applying setting powder or powder foundation to your entire face. It is much less dense than the blush brush so I don't like to use this one for blush. Its large size makes it optimal to cover way more area in less time, unlike the smaller setting brush outlined previously. This brush works best by using broad, sweeping motions across your face. Flat buffer brush: This is also known as a stippling brush and is best used for applying foundation. I like to pump out some foundation onto my hand then dip my brush into the product on my hand. To apply your foundation, use small patting motions against your face. Some people prefer using a Beauty Blender rather than a stippling brush to apply their liquid foundation as they feel it gives them a more air-brushed finish; however, I like using a stippling brush on days where I want lighter coverage or more natural looking foundation. Face brush: This is a brush that is super multidimensional. It can be used to apply foundation using either patting motions or circular motions. I also love to use it to apply highlighter to the tops of my cheekbones. I imagine it can also be used to apply contouring products to the hollows of your cheeks. The world is your oyster with this brush, and that's why it's so fondly loved by so many people. In the photo above, we have (from left to right) a fan brush, a small contour/highlight brush, and a Kabuki brush. Fan brush: This type of brush really only serves one useful purpose - sweeping highlighter across your cheeks/down the bridge and tip of your nose. I honestly have no idea what this brush was used for pre-highlighter era. I don't love the brush I have as I wish the bristles were a bit more dense, but such is life. Small contour/highlight brush: This brush is similar to the setting brush except it is larger. I don't particularly use this for contouring, though I'm sure it would be useful for contouring smaller areas such as your temples or the sides of your nose. I prefer to use this for highlighter if I'm looking to use a denser brush than the fan brush. Kabuki brush: Again, this is a brush that's useful for powder! This is my personal favorite for applying my setting powder after I finish my face makeup. It is the most dense out of all of the other powder brushes I mentioned, plus the bristles are incredibly soft. It feels like a cloud is sweeping product across my face which is completely ideal if you ask me. That concludes this makeup brush miniseries! I hope you found both guides helpful and will have a bit of a easier time navigating the intimidating world of makeup brushes. Leave a comment below with your favorite makeup brushes of all time!